Adele Doesn't Know If She 'Will Ever Tour Again' — But Let's Weigh The Options : The Record On stage in Australia and New Zealand, the singer has hinted at retirement in recent days. Naturally, it's time for a little idle speculation. 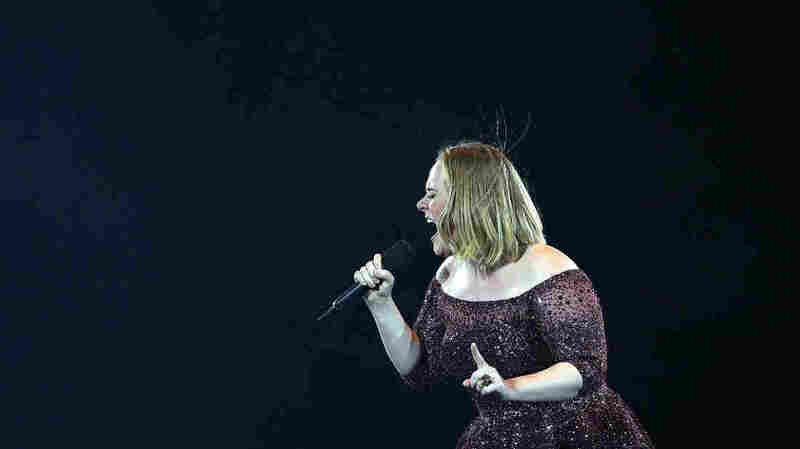 Adele performs at Etihad Stadium in Melbourne, Australia, on March 18. On July 2, Adele will make the final stop on a 15-month tour to support her 2015 blockbuster 25. The tour certainly hasn't hurt: Far and away the best-selling album of recent years — it was top seller of 2015 and 2016, and no other record came close — 25 also won the Grammy for Album Of The Year back in February. But all those live shows have also taken their toll on a singer who's battled issues with her vocal cords, and who hasn't always had an easy time of it as a live performer. At recent shows in Australia and New Zealand, the singer — never one to keep her feelings closely guarded — has suggested that, at 28, she may be ready to retire from touring altogether. According to The Guardian, she told a crowd in Perth that "I don't know if I'll ever tour again." Though far from definitive, let alone legally binding, it's a sentiment she's expressed on stage at other stops in recent days. It's idle speculation to place odds on whether Adele will, in fact, tour again. So it is with deep and abiding shame that we lean back, assess the pros and cons, and bring you the following idle speculation about whether Adele will, in fact, tour again. She's sold tens of millions of albums — and could well sell tens of millions more, with or without touring. Unless she's smashing a Fabergé egg each morning for good luck, or tipping each bellhop she meets with a shiny new racehorse, she doesn't need the money. She could buy an actual castle, retire from public performance in July, and live out a life of comfort based solely on royalties from the albums she's already released (and a diversified stock portfolio). Touring is not a vacation — it's a life of stress and strain. And, more to the point, it has already put serious hurt on her vocal cords. Remember that vocal wear-and-tear has threatened Adele's singing career already; wouldn't it make more sense to save her strength for the studio, considering our first point? She wouldn't be the first singing sensation to simply quit while she was ahead. ABBA, for example, has been offered unimaginable fortunes to reunite, with only vague reports of possible future activity to show for it. Absence, after all, can do wonders for a star's mystique. She's been on tour for more than a year. Most people, if asked to leave their homes and babies and routines and day-to-day lives for a year, would find themselves pretty homesick, no matter how nice it is to sleep in a luxury hotel every night. In other words: Ask her again in 2019, when she's not exhausted and away from home and on display every night. The money will become hard to resist, even for Adele. Tickets to her shows are already extremely pricey – now, imagine that every ticket-buyer is staring down the real possibility that each opportunity to see her will be the last. Remember how much it cost to see Hamilton right before Lin-Manuel Miranda and others were scheduled to leave the cast? If Adele decides she'd like to, say, raise enough money to cure a major disease, it's going to get pretty hard to say no. Plenty of reasons to stop, plenty of reasons to carry on. For now, considering she's been on a continuous cycle of promotion and performance for quite some time, let's just go with: Give her a minute.